Brief documentation on how to build and maintain your new robotic operating buddy. 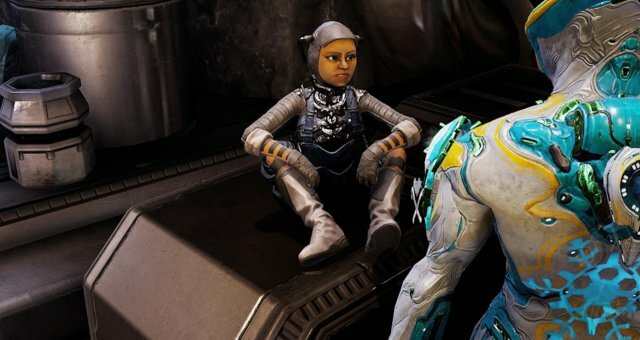 Because I'd hate to see new content go months without any documentation as it was for Zaws and Amps, I've had this guide prepped and ready for several months now in anticipation of, well, my most anticipated content yet. Our very own Moas! And with a vacuum feature right off the bat! These little guys are the most quality of quality-of-life companions; giving the flesh and blood options a serious run for their money. 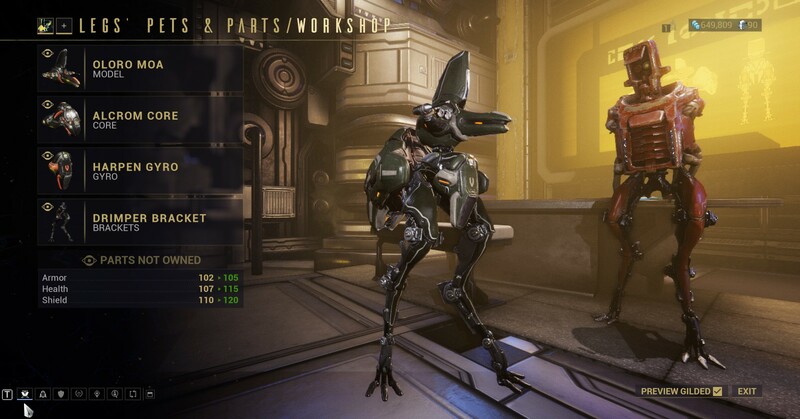 I would like to preface this by saying that, in the end, the choices given are so negligable that you should not feel bad about simply designing a Moa that looks good rather than min-maxing because there is so little min-maxing to actually take advantage of. 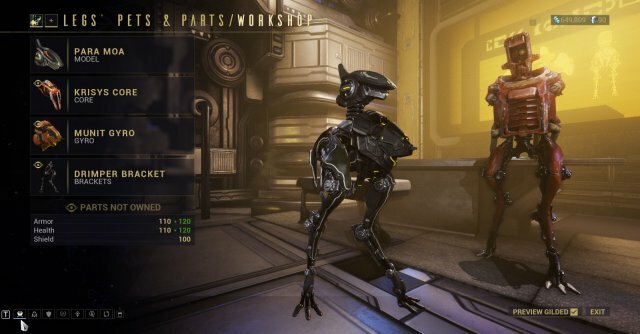 Any fully modded build will be able to survive all the same considering how the Link mods are tied to your Warframe's surviviability stats. In any case, I do hope you find some use out of the documentation here and check back occasionally as more content is added to these new systems. 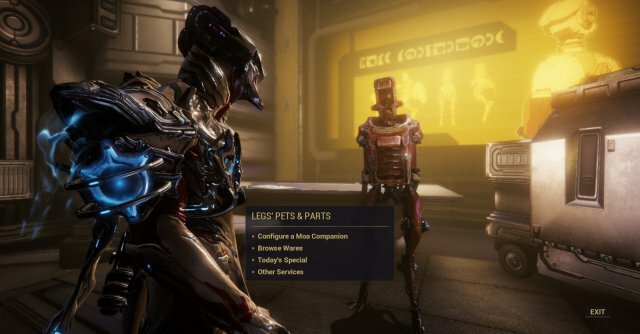 A member of Solaris United offering you parts to construct your own MOA companion in exchange for Solaris United standing. Not sure why they call him Legs. Exchange Solaris United standing for Models, Cores, Gears, Brackets and Moa weapons. Preview complete Moa with any parts. Gild your Moa companion for stat boosts and mastery once they reach level 30. Requires Doer rank with Solaris United. Mastery is tied to the Model. Purchase a pre-built Moa with Platinum consisting of random parts that are shuffled daily. Donate Moas you no longer need in exchange for Solaris United standing. Scales with its level. Rename Moas for a 15p fee. The first choice when constructing your MOA. Determines the two mod precepts that will be available to it. Once you've built all three they may as well be a cosmetic option, seeing as any two precepts can be equipped on any other model with no conflict. This model is built for defense, deploying the Stasis Field and Shockwave Actuator precepts. You've been on the receiving end of this thing before so you know what to expect. Keeps any pesky melee enemies out of the Stasis Field bubble. Doesn't go off enough in my opinion even when listed as the first precept in the modding screen. You should not feel bad for exchanging this for a different precept despite the model. Projects a great big bubble around the Moa, protecting anything within it. The damage reduction is no joke, especially when hugging those squishy Sortie Defense targets. Pair with something like Volt shields and you'll all be snug and safe in a decently-sized AoE. I think this is easily my favorite mod of the bunch. When you're near your Moa and aim while airborne, you'll float in place if staying still or move incredibly slow in the direction you were moving. Finally gives some synergy to a bunch of Airborne-based mods, ESPECIALLY the new Pax Soar arcane for Kitguns. Very handy for reaching mining nodes on cave ceilings as well. Duration stacks with other mods that extend Aim Glide. 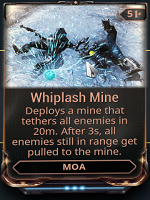 Any glide movement will cease indefinitely if Zephyr uses the effects of this mod. Makes a complete joke out of any "____ while Airborne" Riven challenges. Hacks any console in roughly 5 seconds. Obviously a nice thing to have in Spy and Rescue missions. Currently bugged, but its at least a good sign that you will immediately notice it rushing towards any terminal that needs to be hacked. I believe Tractor Beam's 100% uptime is to blame for the bug, as removing it will allow this mod to function. 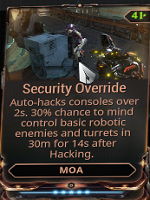 It can also spawn friendly Moas in Corpus tilesets by hacking Moa Cabinet Spawners, but again, is currently bugged. 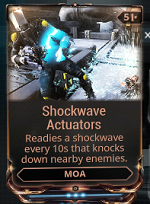 These Moas can not regenerate shields so Mag is a good partner for them in modes like Survival if you want to amass an army. This thing really is a blast. Slurps up all enemies in a good area to the same point, allowing you to blast them with an AoE weapon or effect. It's so effective, that I'm really surprised they haven't put a cap on to how many enemies it can affect at a time. Pairs very well with the above if used in succession. Lobs out a grenade that lifts everything up and up for several seconds or until they come in contact with a ceiling. Makes enemies an easy target. It's pretty neat that they're finally adding gravity-based fall damage to some degree, and some testing is required to find out if things like Sonicor can amplify the "Impact Damage x Height Achieved" numbers. The second part of your Moa. Determines its base health, shields and armor. All values double when gilded. Alcrom - A well-balanced core. Drex - This core features strong shields, but light armor. Krisys - This core features durable armour, but weak shields. The third and final part of your MOA. Determines another percentage of health, shields and armor on top of your Core stats. All values double when gilded. On top of being able to use any mods a Sentinel can, they also have access to the complete selection of Sentinel weapons. 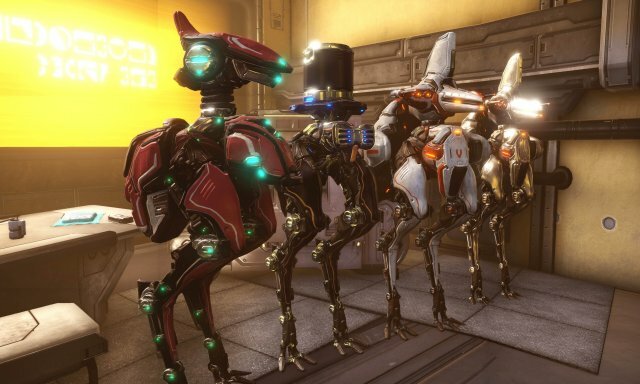 Three more have been added in the Fortuna update for shared use, available from Legs upon reaching the Old Friend rank with Solaris United. Cryotra - Continuous beam weapon that deals Cold Damage. Fires for 6s, then has to wait 4s to recharge. Tazicor - Burst rifle that fires electrified rounds. Vulcax- Charges up a powerful blast of super-heated plasma. Combinations of Chambers, Grips and Loaders as well as suggested mod loadouts. Builds marked with * are best-in-class and can not (currently) be statistically surpassed by any other weapon of its type. Why most of you are interested in the system in the first place. A little armless Limbo spawn to love and call your own. Min-maxing here is forgone in exchange for aesthetics because as I said earlier, these small statistics really mean nothing in the end due to Link mods being tied to your Warframe's own stats. This is a general use build that can serve you about anywhere. Keeps itself, you, your party members and anything you need to defend alive and well in its stasis field. 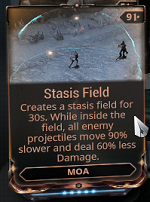 No weapon is equipped so it follows you with the stasis bubble rather than chase after enemies. Very effective in Corpus missions, especially those with breakable glass. No more will you have to suffer having to clean up your own mess when your Moa can do it for you in two seconds. Synergizes well with any frame that creates overshields like Volt, Trinity and Mag. 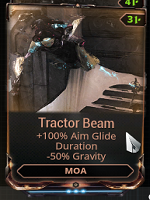 Tractor Beam finally makes all those airborne mods viable as well as syncing incredibly well with the new Kitgun Arcane. My personal favorite out in open-world areas so I can mine nodes on ceilings. The weapon choice is nice and silent to help prevent alarms from going off in the first place. You should go ahead and build the Para Model for its mods and mastery, but I'd hold off on seriously investing into it until the mysterious information above comes to fruition. The idea is to let it go ham on things like the Hyena enemies do, jumping on them, CCing them until they're useless and blasting them to shreds with a great weapon. Q: Can you get MR from Moas? A: An assembled Moa must be leveled to 30, gilded, and leveled to 30 again before obtaining Mastery from the Model. Q: Why cant I recolor my Moa? 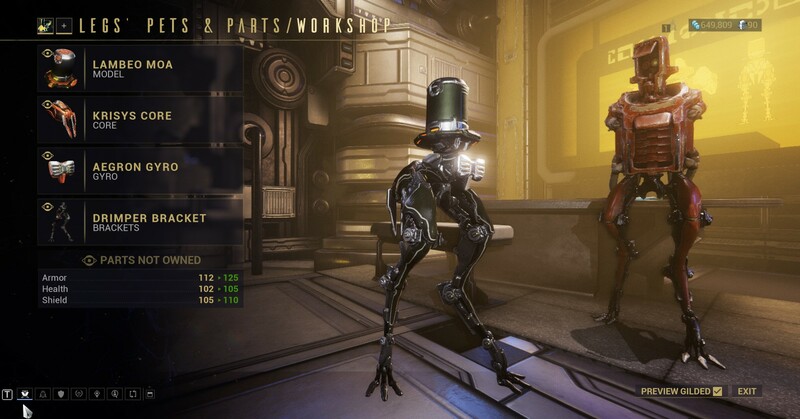 A: You can not change any appearance details until your Moa has been Gilded. 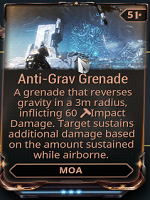 Q: Does Oberon's passive apply to Moas like it does Kavats and Kubrow? Q: What happened to Gyro's originally being Gears? Why are only half the weapons from Tennocon 2018 available? A: I couldn't tell you. I don't think anyone but DE could. We can only wait and hope they in the future they do add the missing grappling hook and ammo regenerator parts. Q: Why can I sometimes hear other people's Moas but not my own? A: They bought those pricey personality packs for 50p each. Can be found and equipped in the appearance menu.